What do I love about my local library? I’ve been able to read so many books that I wouldn’t have been able to read without the library. My son was entertained by storytime, puzzletime, puppet shows, plays, movies, and author talks. 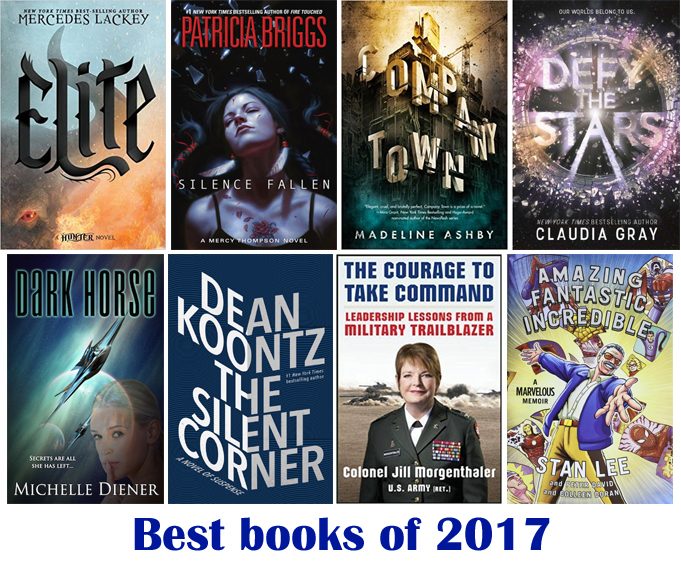 And let’s not forget summer reading programs, Free Comic Book Day, and Star Wars Reads Day! 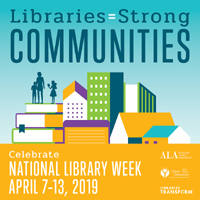 This week is National Library Week, an annual celebration highlighting the valuable role libraries, librarians, and library workers play in transforming lives and strengthening our communities. It’s a chance for us to show our appreciation for our public libraries, who educate and entertain us. This year’s theme, Libraries = Strong Communities, illustrates how today’s libraries are at the heart of our cities, towns, schools and campuses. They are a public space where all community members, regardless of age, culture or income level, can come together to connect and learn. 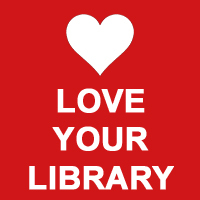 You can get involved by posting photos, videos, or stories on social media highlighting what you love about your library. Use the hashtag #MyLibraryMyStory on Twitter or Instagram or on the I Love Libraries Facebook page for a chance to win a $100 VISA gift card (contest ends Saturday, April 13 at noon CT). 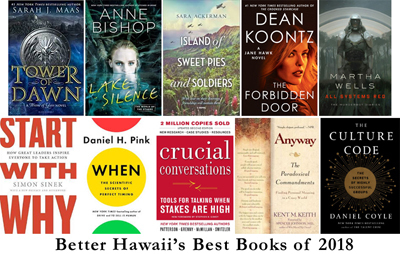 On April 9, 2019 at 1 pm, the Aina Haina Public Library will reopen after completing extensive repairs and renovations caused by flooding a year ago. At 3 pm, there will be cake, refreshments, and goodie bags for keiki provided by Friends of the Aina Haina Public Library. At 6 pm, there will be congratulatory remarks by State Librarian Stacey Aldrich, elected officials and musical performances by special guests. 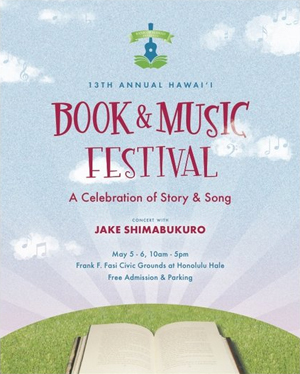 As part of this reopening celebration, the Aina Haina Public Library is launching a new lending collection of ‘ukulele, in partnership with the Music For Life Foundation and Jake Shimabukuro, co-director of the ‘ukulele sponsorship. On April 9, 2019 at 2:30 pm, the Kalihi-Palama Public Library will sponsor a make-and-take color your own bookmark activity for young adults. All week long, there is a “Name that Book” contest for young adults (ends April 13). On April 11, 2019 at 6 pm, the Nānākuli Public Library is celebrating their first birthday. There will be cake and refreshments, a special performance by the Hawaii Opera Theatre, and congratulatory remarks by State Librarian Stacey Aldrich, architect Glen Miura, and Kapi‘olani Baber, Executive Director of the Nānākuli Housing Corporation. On April 12, 2019 at 3 pm, the Ewa Beach Public Library is concluding National Library Week with a free program on Iris Folding. a paper craft technique that involves laying folded strips of colored paper to form a design, of which the center forms an iris reminiscent of a camera lens. Even though it looks complex, creating these works of art is simple. You can find out how yourself at this program. The library will provide the supplies. On April 13, 2019 at 9:30 am to 4 pm, the Makawao Public Library on Maui is hosting their 50th Anniversary Celebration. 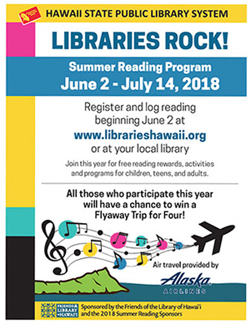 There will be poetry by Betsy Knight and Wade Garcia, a concert by the Kalama Intermediate School ‘Ukulele Band, face painting, a keiki book giveaway, nostalgic Hawaiian music with The Hawaiian Serenaders, and more. What do you enjoy most about your local library? 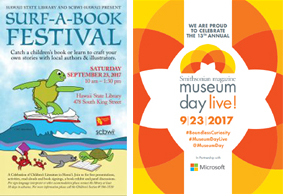 This Saturday, September 23, 2017 there two awesome events that you won’t want to miss: the Surf-a-Book Festival and Museum Day Live! If you read with children or have ever thought about writing a children’s book, you’ll want to catch the Surf-a-Book Festival, a celebration of children’s literature in Hawaii at the Hawaii State Library in Honolulu, 10 am to 1:30 pm. There will be free presentations, children’s activities, read-alouds, book signings, a book exhibit, and panel discussions, with the Society of Children’s Book Writers and Illustrators. Beginning authors and illustrators can dive into their own story and meet local authors and illustrators: Joy Au, Chris Caravalho, Kirsten Carlson, Ellie Crowe, David Estes, Leslie Hayashi, Dani Hickman, Lavonne Leong, Christin Lozano, Alina Niemi, Elizabeth Oh, Jessica Orfe, Tammy Yee, and more. One of the best projects I’ve ever done with my son has been writing a book together. For a second grade recycling project, he created Mr. Roboto out of recycled materials (tissue boxes, plastic bowls, bottle caps) and started writing stories about him. That summer, he wrote and illustrated “The Story of SuperPoliceboto!” The best part of it was opening that bright orange Shutterfly box and seeing his book for the first time. Another great way to spend your Saturday is by bringing the past to life at Museum Day Live!, an annual celebration of boundless curiosity hosted by Smithsonian magazine. Each Museum Day Live! ticket provides free admission for two people. Just find a participating museum or cultural institution, print your ticket or download it to your smartphone, and head to the museum. * Honolulu, Oahu: Hawaii State Art Museum, which features contemporary artwork by artists with a connection to Hawaii (the current exhibit is “Hawaii: Change and Continuity”); Iolani Palace, the official residence of Hawaii’s monarchy; Japanese Cultural Center of Hawaii Historical Gallery, which exhibits Okage Sama De: I Am What I Am Because of You (displaying the Japanese immigration experience from 1868 to modern times) and the Honouliuli National Monument Education Center (highlighting Oahu’s World War II internment camp); and Pacific Aviation Museum Pearl Harbor, which exhibits aircraft and tells the stories of aviation in the Pacific. * Lahaina, Maui: Baldwin Home, the oldest house still standing on Maui; and Wo Hing Museum, a restored social meeting hall for Chinese laborers who helped build tunnels and irrigation systems through the mountains. * Lihue, Kauai: Grove Farm Museum, with authentic sugar plantation buildings and homes, orchards and pasture lands, and operating sugar plantation steam locomotives. The Okage Sama De exhibit at the Japanese Cultural Center of Hawaii is a wonderful experience. Walking through the gallery is like stepping into the past. If you haven’t already visited the Japanese Cultural Center of Hawaii, I encourage you to take your family this weekend! What are your favorite children’s books? Have you ever thought about writing a children’s book? Where will your curiosity lead you?